The Pegasus PCD420 Cash Drawer Series: the perfect solution for applications that can be addressed with a standard duty cash drawer. PCD420 Cash Drawer Series is also the cost effective choice that doesn't sacrifice quality or dependability. 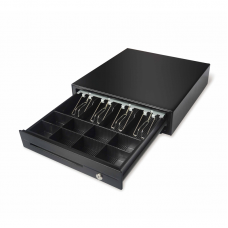 PCD420 Cash Drawer Series is competitively priced and includes features, such as multi function locks and drawer status reporting, found in more expensive cash drawers. A variety of configurations with a wide range of size, style, color, interface and till options are available to meet your specific requirements. FLIP TOP CASH DRAWER 6B8C TRAY.. When it comes to choosing Cash Drawers, ease of op..